If Thomas is their favourite toy. My son loves trains in general and Thomas The Tank Engine in particular. So it comes as no surprise that he absolutely adores visiting Thomas Land in Drayton Manor Park. We have visited a couple of times this year already, most recently to check on the cute Tamarin monkeys when they arrived in their new home at Drayton Manor. We decided to go one better to celebrate his fifth birthday a few weeks back. Instead of the usual day trip, we planned to treat him to an entire weekend of fun at Thomas Land. The place to put up had to be the Thomas-themed Drayton Manor Hotel on the grounds of the theme park. Although check-in was from 3pm, we got to the hotel only around 5:30 after the theme park had closed for the day and the kids had had their fill of all the rides. I say kids, as we were joined by friends. The first thing that struck me was the ease with which we got to the hotel. Being on-site as Drayton Manor Park and Thomas Land meant it took all of five minutes to drive over from the Drayton Manor car park. And no traffic! Perfect for when you are tired and just want to get the kids and yourself to the room as quickly as possible. The car park was a decent size, and although there was a wedding party staying at the hotel on the day, there were enough empty spaces available. On the outside, the hotel does not scream 'Thomas' or even 'Theme Park', for that matter. So you can use it as a base even if you are not particularly keen on either and just want to visit other attractions in and around Tamworth. Once inside, all that changes. Thomas and Friends are everywhere. 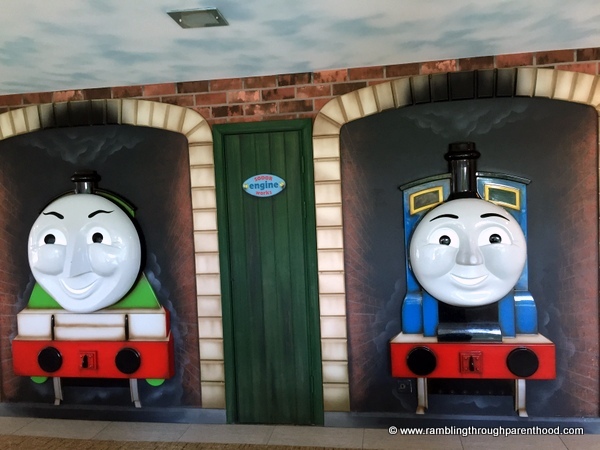 From a little display cabinet, ride-on engines and souvenir shop in the arrivals lounge to wall mounts on every floor, you will see the smiling faces of one or other of these Really Useful Engines everywhere in Drayton Manor Hotel. Perfect when you have kids (and grown ups) that adore these cheeky little engines. Our check-in ran smoothly. We decided to pay-as-you-go, but you do have the option of charging to your room if you so wish. The kids in the party were given little welcome packs with a Thomas-themed activity book, door sign and crayons. Something a little more substantial would not have gone amiss. Magnetic key cards were necessary to operate the lift. This took a bit of getting used to. Being on the second floor meant we could bypass the hassle and just walk up and down the stairs if necessary. 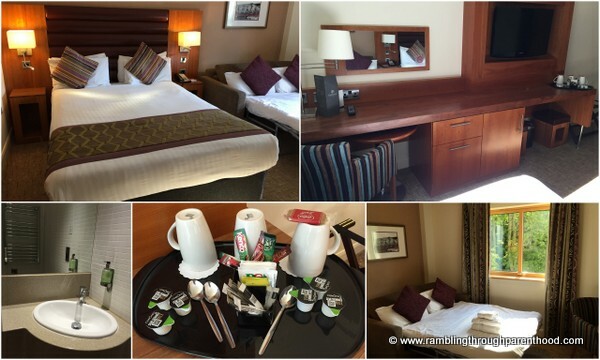 We were in a family room on the second floor with lovely views over the lush green hotel grounds. The first thing that struck me was how there was loads of seating around the play areas and how, despite it being nearly bedtime, there were lots of children still playing with abundant energy! J was impressed with the room. As soon as we walked in, he went in to inspect the bathroom. "I like this nice room," was the verdict. The room was a good size. We had one large double bed with a sofa-bed next to it for J and still had enough room for the child to spread his collection of toy trains on the floor. The free wi-fii and TV meant there was no time for boredom. The beds were really comfy and M, who is a fussy sleeper, did not complain even once. Result! My personal favourite had to be the gorgeous smelling shower gel and the fluffy towels. J too was taken by the fluffy towels and when I wrapped him up in one, he looked and smelt like a little baby. I liked that there was an empty fridge in the room. Not your usual weighted mini bar, but an empty fridge that you could fill up with kids' essentials like milk and snacks. Not exactly self-catering, but still very, very useful. The hotel offers a choice of restaurants and bars, depending on what sort of food you are looking for. We could have eaten at The Grill Inn across the road, but chose to eat all our meals at the Parklands Restaurant and Bar. There was a pizza/pasta buffet on for dinner, and the children were glad for it. A salad bar and pudding spread completed the selection. J was happy with his slice of vegetable pizza, cheesy pasta and cucumber slices washed down with orange juice. It was good value for money too. The grown-ups in the party chose to order from the a-la carte menu. My gnocchi in a creamy spinach sauce was delicious, as were the sweet potato fries I had on the side. The Margarita Martini was lovely too, although I could have done with a larger portion size! Overall, I would say the food was good, enjoyable and priced to reflect the quality. Although the buffet might be better value, I don't think it had enough choice for adults. Make sure to book a table before you venture down to the restaurant as it does tend to get busy. We were back at the Parklands restaurant for breakfast. It is advisable to get in before 9:00 on a weekend morning if you want to beat the rush. Unlike the dinner buffet, the breakfast buffet was full of choices. There was the usual toast, jams, spreads, cereal and milk. There was a selection of fruit, dried fruit, juice, yogurt and croissants. And then there were the hot, cooked options - sausages, deliciously fluffy scrambled egg, fried egg, mushrooms, tomatoes, potato wedges, black pudding, beans and bacon. All to be washed down with pots of tea or coffee. It was sumptuous, it was filling. I wouldn't look anywhere else for breakfast when at the Drayton Manor Hotel. 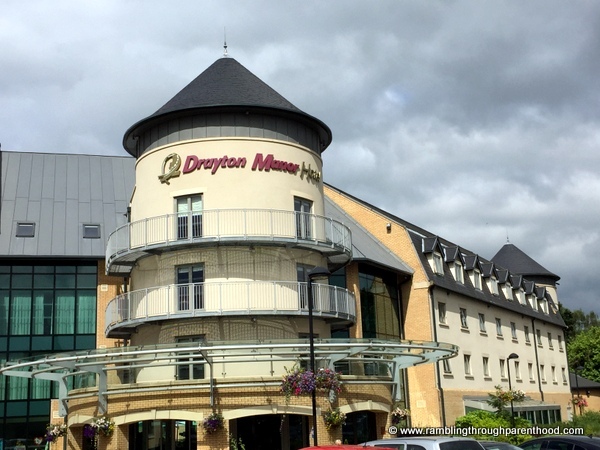 The Drayton Manor Hotel is family friendly. To be honest, I would not have expected anything else for fans of Thomas The Tank Engine. It is the little touches that make all the difference. Like the convenience of the fridge I mentioned earlier. Or little play tables in the restaurant where children can race their engines while the grown-ups catch their breath. Some of the tables could do with a fresh coat of paint, but they were still functional and kept the kids entertained. 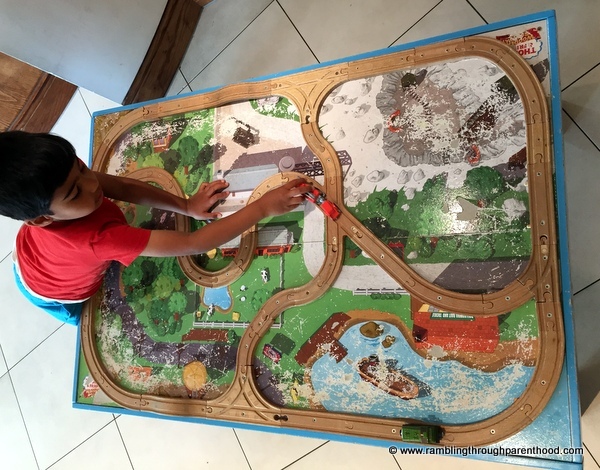 The tracks served as the perfect meeting place for like-minded little ones to share stories about their adventures in Thomas Land, and to show off their brand new engines. The outdoor play area is pretty impressive too. We were fortunate to have some decent weather and there was a lot of climbing, jumping and running involved. The highlight had to be a visit from The Fat Controller after breakfast on the second day. The kids chatted to him about their favourite engines and the rides they had been on. There was talk of kids' entertainment in the evening which we did not find. There was enough fun to be had nevertheless. 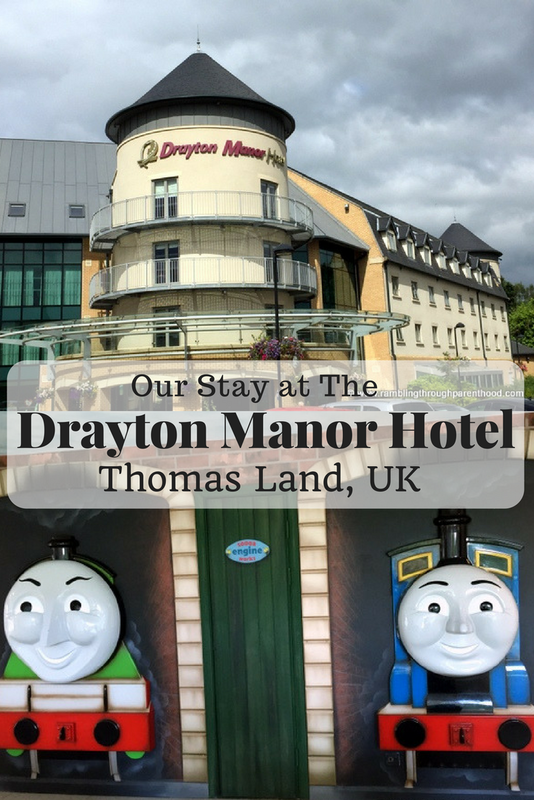 I think the Drayton Manor Hotel is perfect for any fan of Thomas The Tank Engine. It is a fantastic base if you wish to spend more than just a day at Drayton Manor, whether or not you are a Thomas fan. It offers good value for money, especially if you look at some of the stay and play packages that offer discounted entry to the theme park. Disclosure: We received a discounted stay at Drayton Manor Hotel in exchange for this review. All opinions are my own. How did I not know they have a hotel?! My twin girls are massive Thomas fans but we've only ever visited once despite only being an hour away. This looks superb. Must mention to the hub! 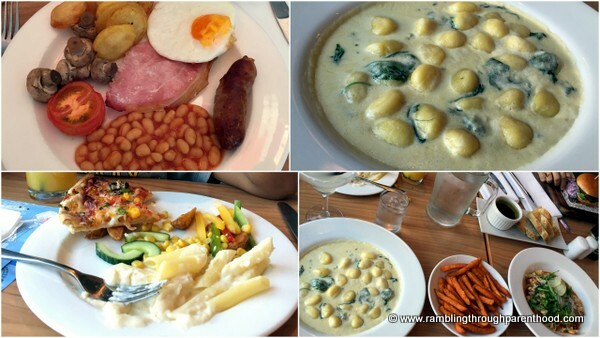 The gnocchi looks delicious , Drayton Manor looks perfect to stay at and I have never been before. This is such a lovely place to stay and have a good time with your family. I know someone might like this place one of my friend kids love train so much! so I definitely tell her about Drayton Manor. I love hotels that are family-friendly. T used to love anything about Thomas the Tank Engine, but I'm afraid has out-grown them now. What a child friendly hotel. That is so important as it makes it far more relaxing for the grown ups as there are fewer tantrums! 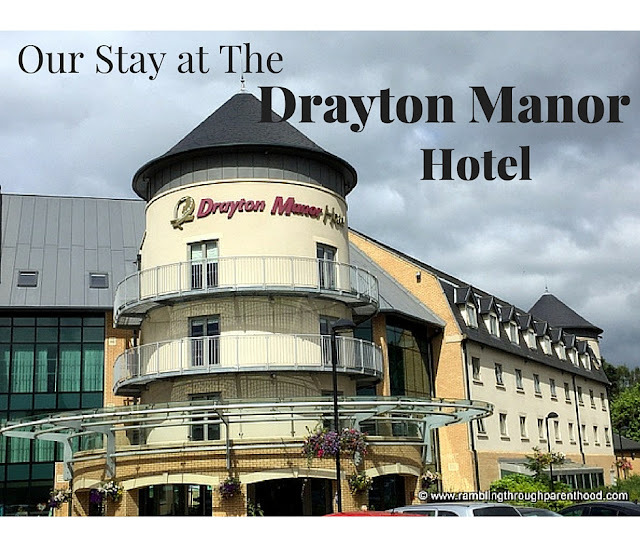 How did i not know there's a hotel at Drayton Manor! Growing up my younger brother was a huge TTTE Fan! He would have loved this since we went every year! My nephew would have a field day here, sounds lovely and so much to do. 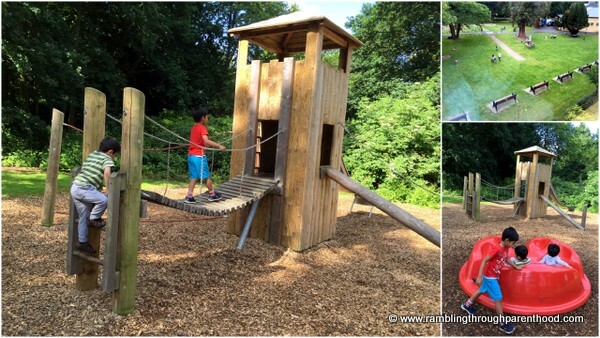 Drayton Manor looks amazing and I love that it is genuinely friendly and caters to kids. That is very important. What an excellent idea to have play tables in the restaurant. Lovely idea.